There is plenty of evidence that people who live in marginalised, low-socio economic communities die younger and have poorer health than people from higher socio-economic communities [1-4]. Health is remarkably sensitive to social environments  and thus it is a complex problem needing to be addressed at multiple levels. Personal health practices and coping skills. These poorer health comes are the result of many complex historical, social, economic and environmental factors including colonisation, racism, poverty, dispossession and inter-generational trauma [8, 9]. Of course it is important to recognise there are also many strengths in Aboriginal communities that can be drawn on in promoting health [10, 11] including strong connections to country and community, the role of community and extended family in caring for children, strong networks of care and the role of Elders and elderly family members in family functioning. For a more detailed discussion see Lohoar, Butera, & Kennedy (2012) . Individual health is enabled or inhibited by social context. Although human agency and people’s choices are import, the social context people find themselves in (including gender, class and ethnicity) have a large influence on people’s experiences, choices and behaviour. The human body is simultaneously social, psychological and biological. It is much more than simply biology, physiology and anatomy. Health is cultural. The ways in which health is perceived and the experience of disease and illness are expressed vary from culture to culture. Biomedicine and medical science is something–but not everything. Health is political. Political decisions and processes have a big impact on health and the social determinants of health. Other voices matter. It is important to hear the voices of people outside of the medical profession as they can provide valuable insights and ideas. A clean, safe, high-quality physical environment (including housing). An ecosystem which is stable now and sustainable in the long term. A strong, mutually-supportive and non-exploitative community. A high degree of public participation in and control over the decisions affecting one’s life, health and wellbeing. The meeting of basic needs (food, water, shelter, income, safety, work) for all the city’s people. Access to a wide variety of experiences and resources, with the possibility of multiple contacts, interaction and communication. A diverse, vital and innovative economy. Encouragement of connections with the past, with the cultural and biological heritage and with other groups and individuals. A city form that is compatible with and enhances the above parameters and behaviour. An optimum level of appropriate public health and sick care services accessible to all. We need to be careful about creating a false dichotomy between social and biological “determinants” of health as there is a complex interplay between a multitude of influences [1, 6, 15]. In the current neoliberal political climate there is also a real risk that approaches to social determinants of health “privatize risk and responsibility” . Such approaches see people’s individual choices and failings as being responsible for poverty, unemployment etc., and ignore the influence of macro and structural issues [3, 16, 17]. As Germov  argues, social models of health imply there is a social responsibility to ensure that people have healthy living and working environments. It should compel us to consider not only strategies that promote heath at an individual level, but also strategies that improve the context in which people live, work and play through social change at a political, structural and economic level. Yuill, C., I. Crinson, and E. Duncan, Key concepts in health studies. Sage key concepts. 2010, Los Angeles ; London: Sage. Wilkinson, R. and M. Marmot, Social Determinants of Health – The Solid Facts. 2003, World Health Organization,: Geneva. p. 33 p.
Bryant, T., et al., Canada: A land of missed opportunity for addressing the social determinants of health. Health Policy, 2011. 101(1): p. 44-58. 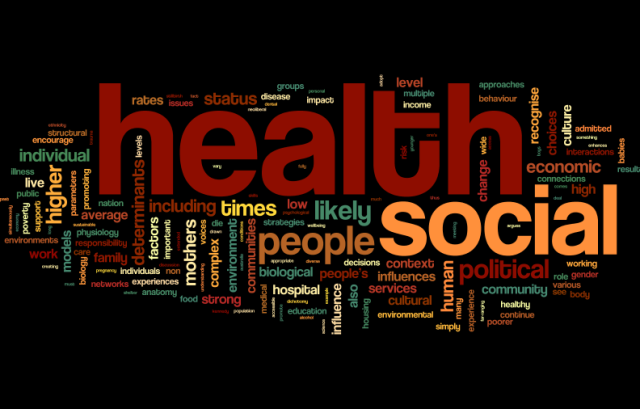 Germov, J., Imagining health problems as social issues, in Second opinion : an introduction to health sociology, J. Germov, Editor. 2014, Oxford University Press: South Melbourne. Public Health Agency of Canada. What determines health? 2011 29 May 2015]; Available from: http://www.phac-aspc.gc.ca/ph-sp/determinants/#key_determinants. Department of Human Services, Environments for health: Promoting health and wellbeing through built, social, economic and natural environments. 2001, Melbourne: State Government of Victoria. Bambra, C., et al., Tackling the wider social determinants of health and health inequalities: evidence from systematic reviews. Journal of Epidemiology & Community Health, 2010. 64: p. 284-291. Bowes, J. and R. Grace, Review of early childhood parenting, education and health intervention programs for Indigenous children and families in Australia. (Cloing the Gap Clearinghouse Issues Papers No. 8). 2014, Canberra: Australian Institute of health and Welfare and Australian Institute of Family Studies. Aboriginal and Torres Strait Islander Social Justice Commission, Social Justice Report. 2012, Sydney: Australian Human Rights Commission. Geia, L.K., B. Hayes, and K. Usher, A strengths based approach to Australian Aboriginal childrearing practices is the answer to better outcomes in Aboriginal family and child health. Collegian: The Australian Journal of Nursing Practice, Scholarship and Research, 2011. 18(3): p. 99-100. Lohoar, S., N. Butera, and E. Kennedy, Strengths of Australian Aboriginal cultural practices in family life and child rearing (Child Family Community Australia Paper No. 25). 2014, Melbourne: Australian Institute of Family Studies. Hancock, T. and L. Duhl, Promoting health in the urban context. WHO Healthy Cities papers, No. 1. 1988, Copenhagen: WHO Regional Office for Europe. Rydin, Y., et al., Shaping cities for health: complexity and the planning of urban environments in the 21st century. Lancet, 2012. 379(9831): p. 2079-2108. Tanata -Ashby, D., What is a healthy community? Building healthy communities in Southern Nevada. The Lincy Institute Research & Policy Briefs, 2012 (January). Sallis, J.F., N. Owen, and E.B. Fisher, Ecological models of health behaviour, in Health behavior and health education: Theory, research, and practice, K. Glanz, B.K. Rimer, and K. Viswanath, Editors. 2008, Jossey-Bass: San Francisco. Schrecker, T., How not to think about social determinants of health: A cautionary tale from Canada, in Healthy Policies for a healthier world. 2012. Navarro, V., What we mean by social determinants of health. International Journal of Health Services, 2009. 39(3): p. 423-441. This entry was posted in Working with communities and tagged Community development, Community engagement, For students, Health, Social models of health. Bookmark the permalink. 1 Response to What are social models of health?